Cast Size: Male: 7 Female: 3 Ensemble: Large, anywhere from at least 12 up. Total Cast Size: 22 and up. Orchestra: 24 or so, could be done with a far more limited orchestra. Maybe piano, bass, percussion, and about 4-5 other pieces including a synth or two. Let’s say 10-11 musicians. Recordings: Many. Love Merman in it. Enjoyed Bernadette Peters. Mary Martin played it when it toured. A major role for major Musical Comedy actresses. Film: An okay film version. Aired twice on TV, once with Mary Martin, once with Merman. Other shows by the authors: Berlin: (movies) Top Hat, White Christmas, Easter Parade, Follow The Fleet, Carefree (theatrical) This Is The Army, As Thousands Cheer, Call Me Madam (He composed the songs for 19 Broadway shows and 18 films!) Dorothy Fields: Sweet Charity, Seesaw Herbert Fields: A Connecticut Yankee In King Arthur’s Court, many others. A great show for large companies with some money to spend (it can be held down a bit, as I’ll explain later), and a very strong female lead. High Schools could do it, the music isn’t too tough and neither is the dance or tech. Colleges and Universities certainly could consider it. Larger Dinner Theaters, Regional houses and companies, some stock and semi-pro companies, and certainly Broadway. It should be produced more often than it is. There is material in the original show that Native Americans today find offensive. This includes the numbers “Colonel Buffalo Bill”, and “I’m An Indian, Too”, and these are generally cut today. This is a pretty big show, with specific demands. I think the sets can be rather easily done. But the costumes and the props may be costly and need to be well done. Interestingly enough, the acting, choreographic and vocal demands are not overwhelming, outside of your leads. ACT ONE: When the traveling Buffalo Bill’s Wild West Show visits Cincinnati, Ohio (“Colonel Buffalo Bill”, usually cut today), Frank Butler, the show’s handsome, womanizing star (“I’m a Bad, Bad, Man”), challenges anyone in town to a shooting match. Foster Wilson, a local hotel owner, doesn’t appreciate the Wild West show taking over his hotel, so Frank gives him a side bet of one hundred dollars on the match. Dolly Tate enters with younger sister Winnie, and her young boyfriend Tommy. Dolly, Butler’s assistant in his shooting act, objects to Tommy’s giving attention to her younger sister and threatens to have him thrown out of the show. Annie Oakley enters and shoots a bird off Dolly’s hat, and then explains her simple backwoods ways to Wilson with the help of her siblings (“Doin’ What Comes Natur’lly”). When Wilson learns she’s a brilliant shot, he enters her in the shooting match against Frank Butler. As Annie and Frank prepare for the show, Frank plans to propose to Annie after the show and then ruefully admits that “My Defenses Are Down”. When Annie performs her trick and becomes a star, Chief Sitting Bull adopts her into the Sioux tribe (“I’m An Indian Too”) and invests much-needed money into wild Bill’s show, leaving Pawnee Bill’s show. Hurt and angry, Frank walks out on Annie and the show, joining the competing Pawnee Bill’s show. ACT TWO: Returning to New York from a tour of Europe with the Buffalo Bill show, Annie learns that the show has gone broke. Sitting Bull, Charlie, and Buffalo Bill plot to merge Buffalo Bill’s show with Pawnee Bill’s as they believe that show is doing well financially. Annie, now well-dressed and more refined and worldly, still longs for Frank (“I Got Lost in His Arms”). 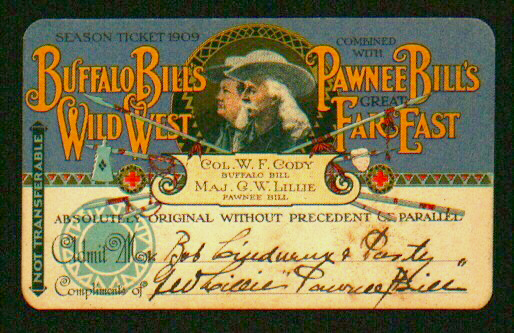 Pawnee Bill, Dolly, and Frank also plot a merger of the two companies, assuming Buffalo Bill’s show made a fortune touring Europe. When they all meet, they soon discover both shows are broke. Annie, however, has received sharpshooting medals from all the rulers of Europe worth one hundred thousand dollars, and she decides to sell the medals to finance the merger, rejoicing in the simple things (“I Got the Sun in the Mornin’”). When Frank appears, he and Annie confess their love and decide to marry, although with comically different ideas: Frank wants “some little chapel,” while Annie wants “A wedding in a big church with bridesmaids and flower girls/ A lot of ushers in tail coats/ Reporters and photographers” (“An Old-Fashioned Wedding”). When Annie shows Frank her medals, Frank again has his pride hurt. They call off the merger and the wedding, but challenge each other to one last shooting match to decide who is the best shot. On the ferry to the Governor’s Island match site, Dolly attempts to ruin Annie’s chances by tampering with her guns. She is caught and stopped by Sitting Bull and Charlie. However, they then decide to follow through with Dolly’s plan so that Annie will lose the match, knowing that would soothe Frank’s ego allowing the two to reconcile and the merger to take place. As always, feel free to ignore or skip my opinion and rating. If you end up with buckshot in your trousers, not my problem. Annie Get Your Gun is Irving Berlin’s best show and the best score he ever wrote. At first, he had to be talked into doing the show. He did not feel he could write songs that integrated into a story the way the producers of this show, Rodgers and Hammerstein, had done and made popular. Famously, he asked for a few days to try it out, and came back to R&H with the songs “Doin’ What Comes Naturally”, “You Can’t Get a Man With a Gun”, and “There’s No Business Like Show Business.” Needless to say, they proceeded. Another famous tale is that Berlin mistakenly believed Rodgers did not like the song “There’s No Business Like Show Business”, and so cut it from the show. Fortunately, this anthem for all that we who love showbiz hold dear was rapidly restored, and I imagine Rodgers told Berlin he was out of his mind for cutting it. Berlin was the first truly great American song writer. The son of Russian immigrants, he wrote (among hundreds of hit songs) “God Bless America”. He wrote many successful Broadway shows – but few of them can withstand public scrutiny anymore, largely due to their silly books. Even this show, undoubtedly his theatrical masterpiece, has been rewritten (I think poorly) recently. This show is about real people. 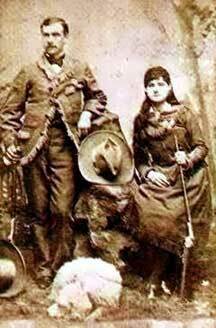 Annie Oakley, Frank Butler, Buffalo Bill Cody, Sitting Bull, and Pawnee Bill all existed and had real lives. As you can see from the last photo, Buffalo Bill and Pawnee Bill did indeed combine their shows, finally, just as happens in the musical. The Musical makes no claim of being some kind of historical document, as say the Musical 1776 does. But these were real people, and the events covered in the musical are entertaining versions of real history, as was the case for other musicals like Ragtime, The Unsinkable Molly Brown, and Pacific Overtures. I really enjoy shows like these as a rule, because I enjoy history almost as much as theater. And there aren’t many Musicals about the wild, wild west (Destry Rides Again, Paint Your Wagon, Calamity Jane which is an Annie Get Your Gun knock-off), which makes this show even more unique. This is a terrifically entertaining show. It’s fun, a little touching, with a wonderful score, easy roles to cast overall as the demands per role (except the two leads) are not very strenuous, and a fairly easy show to mount on a technical level. Its songs are brought to you by the man who composed “Easter Parade”, “White Christmas”, and hundreds of other hits. Kind of hard to go wrong with this unless you miscast the leads, or do a generally terrible production. The songs have Berlin’s characteristic directness. They are memorable, simple without being simplistic. This is not a very hard show to teach or learn, but does take some work to play. Your Musical Director should be rather expert with Broadway styles of the 40s. A big show, probably for an experienced M.D. Must play with energy and heart, the feeling must be communicated to the actors and audience for Berlin’s gorgeous ballads. Annie Oakley- Mezzo, good or huge belt required, decent high notes, an unexpected sweetness when she sings love songs. Must sing well with accent. Frank Butler – Classic Baritone, big mid-register, full and trained voice. Capable of warmth in singing ballads. Buffalo Bill – Lyric Baritone, character-driven, must sing with western accent. Good energy. Tommy Keeler – Ingenue Lyric Baritone, clear mid-range, good high belt. Can sing with accent. Winnie Tate – Ingenue Soprano. Can sing with accent. Pawnee Bill – Baritone, good belt and energy. Ensemble – Good belt voices, good at harmonizing. The “dance” in this show is theatrical, but limited to an off-handed “country” style that feels more “real” and improvised than many Broadway shows. The less “staged” the numbers feel, overall, the better, and that requires a special art from a Choreographer. Few numbers will need real “dance” outside of “There’s No Business Like Show Business”, and “I’m An Indian, Too”, which is liable to be cut. At the most, really, a Choreographer might be involved with “Colonel Buffalo Bill” (often cut), “I’m A Bad, Bad Man”, “There’s No Business Like Show Business”, “Moonshine Lullaby”, “I’ll Share It All With You”, “I’m An Indian, Too” (often cut), “Who Do You Love, I Hope”, “I Got The Sun In The Morning”, “Anything You Can Do”, and “There’s No Business Like Show Business (finale)”. That may sound like a lot, but it’s very possible the Director would stage the numbers not cut except for “There’s No Business Like Show Business”, and maybe not even that. This isn’t a dance show. Numbers are integrated and character-driven, and there’s no real dance for the sake of dance. All musical stagings for this show should revolve around the characters, who they are, what’s going on in the developing relationships. “I’m A Bad, Bad Man” shows Frank with some lovely young women, and gives his story with Annie a place to start. We see the sort of women that he’s drawn to – well-gowned, sophisticated. Annie is anything but, it appears to be mission impossible. “There’s No Business…” is the show biz anthem. It is rousing, energized, explosive in its embrace of Annie and the audience. There should not be a person in the house at the end of the number who is not ready to run away with the circus. It is heartfelt, not glitzy. There are no numbers in the show that are not “meant” by the characters singing them, direct and honest. It may sound odd, but this number needs to project an air of sincerity. These people love their life. They are united in that love, which is what will allow the two shows to join at the end of the Musical. “Moonshine Lullaby” is sung by Annie and a quartet or so, on a train, to put her siblings to sleep. It is gentle, smooth, rhythmic in the way a train might be, and the motion of the train should mate with the rhythm to give you movement. Keep it simple, lovely. The Winnie/Tommy numbers, “I’ll Share It All with You”, and “Who Do You Love, I Hope” are youthful, energetic, and can include some dance for the two actors. Just cast dancers in the roles. The show could use some movement. The movement should be quasi-western, and help illustrate their relationship. The numbers are comic relief, and should get a laugh or two. “I Got The Sun In The Mornin’” is a glorious, rousing, vital number for Annie and the company. It is an anthem of hope and optimism, almost an up-beat gospel hymn if such a thing exists. Fill the movement with genuine joy, fill the stage, open the picture up. A chance for some dance. “Anything You Can Do” is certainly one of the best-known and loved of all “I hate you because I really love you” duets. This is a truly funny number, and the action is spelled out in the lyrics, so don’t go crazy staging the piece much. The lyrics are primary here, they must be heard and understood, and acted. Don’t let dance, or any characters outside of Annie and Frank, get in the way. Not much dance. Musical staging, yes, dance, not so much. A good show for a newbie with some chops to work their way in as a Choreographer or in the chorus as a dancer. Annie Oakley- 20s-early 30s. Tough, scrappy, self-deprecating. A country girl born and bred, who knows exactly what to do with a gun and with moonshine. She’s got a temper, but is a good and sweet soul under all that dirt and gunpowder. Requires a very fine comic actress. Cast for voice, type, acting, some movement. Frank Butler – Mid 20s-40. Handsome, charismatic, arrogant, with delicate feelings that are easily offended. Like Annie, he has a temper. But there is a romantic in there, longing for the right girl to come along, who is willing to discover what exactly the right girl might just be. Cast for voice, type, acting, some movement. Buffalo Bill – In his 30s-40s, with a long ornate beard, a genuine product of the wild west who has gone show-biz. A proud, almost stentorian voice and manner when performing – and when is he not performing? Cast for acting, type, voice, some movement. Tommy Keeler – Late teens-early 20s, the ingenue comic dance lead. Hormone-inspired, comic actor. Cast for acting, type, voice, dance, must do all well. Winnie Tate – Late teens-early 20s, Tommy’s female counterpart. Stubborn, somewhat pragmatic. Cast for acting, type, voice, dance, must do all well. 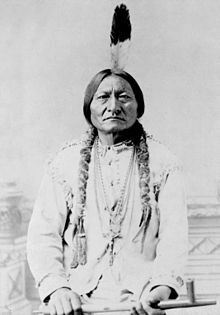 Chief Sitting Bull – In his 50s, a genuine Indian war hero. He truly admired Annie Oakley, and the feelings were mutual. Kind-hearted, practical, almost a grandfather figure for her. Cast for type, acting, voice. Pawnee Bill – Younger man, in his late 20s at that time. A showman. Cast for type, acting, voice. Charlie Davenport – Mature man, in his 30s-50s, an overworked employee of the show. Cast for acting, type, voice. Foster Wilson – In his 40s-70s, owner of a local hotel. Intuitive, practical, even skeptical. Cast for acting, type. Dolly Tate – 30s-40s, healthy, fine-looking assistant to Frank Butler. Cast for type, acting, voice, some movement. Ensemble – All must sing and move well enough, strong belts, good at harmonizing. Types you might see around a Wild West show. One version had a large ring set up almost the width and depth of the stage, and played the show as if Annie’s life was the “show”” we were all seeing at the combined Bill’s Wild West show. I like the conceit of placing everything into one or three rings like this, it integrates the show together, allows whatever set changes you’re going to do to be done by visible “stagehands”, and is inexpensive. Placing a show wagon of sorts at the back of the ring will provide entrances and exits. Whatever you do, I would not go the full set approach for every location, few stages can hang that many set pieces, few crews can run them. Backdrops get very boring, as well. And today, audiences don’t need their theater to be quite so literal. Whether you’re on a proscenium stage or an open stage, an amphitheater or someone’s backyard, the unit set will work better for Annie Get Your Gun. By reducing the number and complexity of sets and set changes, you’ll speed up the delivery and timing of the entire show, which I cannot recommend too strongly. This is a fine and fun show, but not a deep one. It will not withstand close scrutiny. A Director should not give the audience a lot of thinking time during the show itself, and the Designers should aid and abet the Director’s efforts to keep it all moving. This is a show about show-biz of a specific type, and I think the ’99 revival, which I saw, had the right idea. A “large” ring – open at the front to allow action to spill forth onto an apron, or even into the house – and two smaller rings where intimate, smaller scenes could transpire, provides that “three ring” illusion and allows the action to never stop. One scene can be stepping into an empty ring even as the last scene goes dark. Three playing areas should facilitate rapid play. As to the locations of scenes, you can represent these. Cities can be signs lowered over specific rings on stage, for Minneapolis or what have you, as in “Welcome To…” Benches, bales of hay, simple objects can stand in for sets, more often than not. I would move this show into a “High Concept” that will support its fun, and at the same time make it feel a touch more contemporary. It’s the right instinct. Even this simple set will need to be built, and perhaps the center “ring” can provide a rake, or elevated section at one corner, to give it all levels. An easy set, though, done the way it’s been described. And get some color up there. Flags, banners, bunting are all a part of such shows! And a backdrop that is a huge poster for the Wild Bill show, and which transmogrifies into a dual poster for the combined show at the end, could be effective. You can lose it by not lighting it, when desired. Period, and fortunately there’s lots of photographs from the mid 1880s, when the story takes place. Some clothing may show up in closets and in thrift stores. But the period and location is specific. You may be able to rent much of what’s needed in a larger costume shop. But you may need to adapt existing shirts and pants, chaps and boots and the like. The colors tend to be a bit drab in this sort of period garb. Wild Bill, Frank and the other show people are, however, show people. There should be their version of bling, of flash and sparkle, studs and medals, all over their costumes. Their hats are bigger than most, and shine. They would know the value of such ostentatious display and would (and did) indulge. Annie acquires a taste for such display, but starts out almost in rags, dirty and distressed. Also, do remember that your leads sing a lot and need to be able to move and breathe easily. A big job, not for a novice. Guns, and more guns, all from the period, all able to fire with noise, all non-functioning (duh). Whips, knives, other western gear. Fans for the occasional lady. There’s likely to be a number of props, and they all need to look period correct. The guns will be the most important props. A job for an experienced prop master. It’s a Broadway-type Musical, and the costuming and set may lack color and pop, so the lighting will need to carry some of the excitement quotient. Larger numbers should shine warmly. “No Business Like…” should embrace the entire stage, and the lighting should communicate excitement. Maybe you could even place a chase around the perimeter of the stage and flip it on at the end of the number, it would fit in more or less. Love songs should soften in intensity, of course. “They Say It’s Wonderful” is special, and should feel special in terms of lighting, a moment isolated in time and space. Not a job for a beginner. Unobtrusive. Annie and her kin are dirty when we first see them, and the floozies hanging around Frank at the top of the show are an extreme contrast to Annie. They should be heavily glamoured up, wigs and all. For the most part, not much that’s visible. You may well need to build a beard for Buffalo Bill. Not too tough an assignment. Given the strength and intimacy of the score, the simple technical values, lack of choreography and the rest, this piece might almost play as a Chamber Musical, with a reduced cast size. It would be a noble experiment for some brash producer to try someday, maybe with about twelve actors or so. And speaking to the producer, I love the idea of promoting this show with posters that replicate those of the real Wild West shows, using your actor’s photos. Part of the fun of doing what is, in essence, a “backstage” musical. Your ads won’t look like everyone else’s ads. Will this show survive? I think so, as it isn’t authored in a way that will particularly date it. The songs will always be fun and catchy. The objectionable material is easily moved around. As long as there are talented, charismatic female Musical Theater stars, there will be production of this show. When is Sutton Foster going to do it? She certainly should.